Summary for the Busy Executive: Interesting. Most Jewish liturgical music is either very old – the cantorial chants – or reasonably new – since the 19th century. This CD offers a range. In a way, the title misleads a bit. This isn't an all-Jewish disc, secular or sacred, but one does find, as they say, a minyan. I suspect that the only composers people have at least heard of are Rossi, Starer, and Bloch, and, indeed, those have contributed strong pieces. Rossi was an oddity: an Italian Jewish composer of the Renaissance. Well-thought-of (as a composer, at any rate), he knew Monteverdi. His music has never turned me on, particularly, but I admit its craft. His setting of the psalm "By the rivers of Babylon," appropriately grave, typifies his choral output. Robert Starer, born in Vienna, emigrated to Palestine in the Thirties and later became a naturalized U.S. citizen. He remains, unfortunately, a composer's composer, despite some strong scores, including concerti for viola and for clarinet as well as chamber music. "Give Thanks to the Lord," though not as dissonant as he usually gets, nevertheless shows off his virtues of direct communication and no wasted notes. I've collected recordings of Bloch's music since I was a teen. I can safely say I've listened to most of his catalogue. However, the two organ pieces here I had never heard of. Indeed, until now I didn't know he had written for solo organ. These two works belong to a set of six organ preludes Bloch wrote for liturgical use. Orthodox Judaism doesn't use the organ at all, so Bloch meant his preludes, like his Sacred Service, for Reform (and possibly Conservative) worship. The preludes here are solid and beautiful, although not as exciting as other Bloch scores. I've noticed that all six preludes are available from the German label MD&G, and you'd better believe I've obeyed my obsessions and ordered it. I enjoy the fact that these potpourris often introduce me to some neat composer I haven't heard. Tzvi Avni's "Mizmorei tehillim" perked my ears up. Avni, born in Germany, emigrated to Israel, where he studied with Paul Ben-Haïm, among others. His early work shows the influence of that "Mediterranean style." However, apparently he began to absorb other influences – first Bartók, then aleatorics and electronics – although he never seemed stuck in any particular mode. Lately, he's moved back to a kind of neo-tonality, though still dissonant. "Mizmorei tehillim," a setting of three psalms, comes from the Bartók side of him. The first movement sets parts of Psalm 47 ("O clap your hands") the second movement a verse of Psalm 48 ("Beautiful are the places of Mount Zion"), and the entire Psalm 150 ("Praise ye the Lord"). The outer movements move with strong, asymmetrical dance rhythms and in repeated short motives. The inner movement proceeds slowly and largely by contrapuntal imitation. Like the Starer, there seems no hitch between music and listener. Some of these pieces strike me as kleine Kapellmeistermusik – well-made, nice-guy stuff, but nothing that gets the blood going. I'd put the Schalit, the Freed, and the Nelson in that particular bin. Other pieces have no liturgical or secular to Judaism at all – the Ticheli, Kubik, and, again, the Nelson. Ticheli "There will be rest" has become a choral hit, and deservedly so. It sets beautifully a poem by Sara Teasdale. Kubik, a pupil of Sowerby, Rogers, Piston, and Boulanger, arranges a spiritual, "Creep Along, Moses," for virtuoso choir in a virtuosic way, emphasizing syncopation and unanimity of attack. The other arrangements of traditional material all show high quality and range rather broadly in style. Mark Zuckerman takes a Schubertian Männerchor approach to Yiddish songs. Stephen Prussig's "Hayo, haya" I think of as the Jewish equivalent of Kubik's "Creep Along, Moses" – rhythmically forceful and taut. 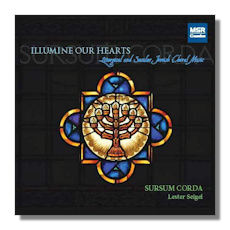 Lester Seigel's Sursum Corda, from Birmingham, Alabama, although not terrible, doesn't quite hit the mark. Judging by their soloists, I feel they simply don't have the voices. Furthermore, their intonation is a bit wonky, with the basses tending flat and no section truly in tune with another. Nevertheless, I don't think it enough to sink the disc, and I recommend much of the repertoire.